Best Approach offers a variety of scorecard design, features and format options that accommodate a full range of budgets. For as little as $998 for 20,000 cards, this format provides top quality printing on an 80 lb. 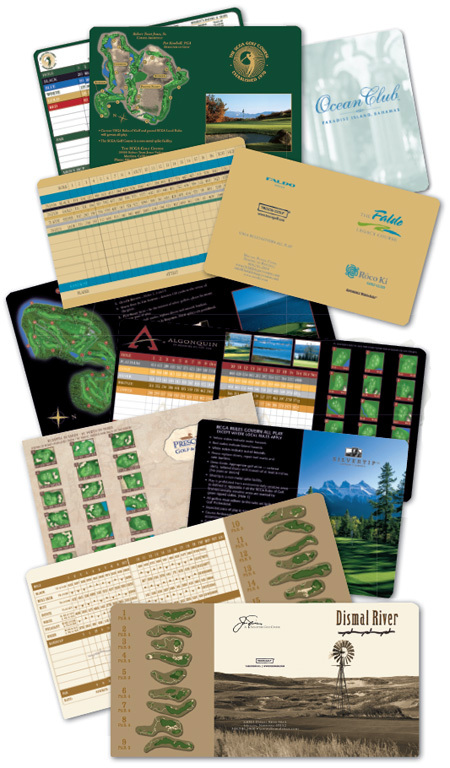 coated cover stock—typical in the golf scorecard industry—but lighter than Best Approach’s standard scorecards. Our standard scorecard is now printed on 10% recycled paper with soy-based inks, allowing courses to combine environmental responsibility with fiscal prudence. Scorecards are designed to enhance the status of your facility while retaining maximum usefulness, complementing other marketing materials. Classic scorecards may opt for a wide variety of papers and formats. Because we design and print every scorecard at our facility, we offer the widest variety of options at the best possible value. Order your annual supply of scorecards, but take delivery and pay for them throughout the year. Ask for details.